A draft report from the Senate Appropriations Committee, responding to HHS’s FY2015 budget request, proposes to give ONC $61 million of the $75 million it requested. 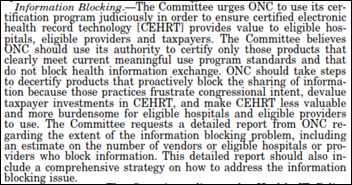 It adds that ONC should publicly report and then decertify EHRs that “proactively block the sharing of information.” It also wants the Health IT Policy Committee to create a report describing the challenges to interoperability and whether certification helps or hinders it. Reading down the long list of funded projects, it’s depressing to see how much taxpayer money is being dumped into government programs that claim to help one issue or another. All that aside, the interesting dynamic here is that ONC, like every government agency unwilling to reduce its budget or authority, keeps trying to expand its mission while Congress seems to think it is overstepping its authority and questions its effectiveness. I suppose $75 million is a rounding error in the federal budget, but as a taxpayer, I might question ONC’s value, along with what I’m getting for my $25 billion in HITECH handouts to providers who mostly regret having given up control in return for strings-attached government money. 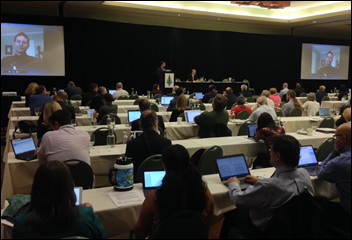 From All Hat, No Cattle: “Re: pic from the Redwood Mednet conference in Santa Rosa, CA. I see the audience is a lot of older hippie types and open source geeks like Wes Rischel, Will Ross, John Mattison, David McCallie, etc. discussing HIEs with John Halamka.” There’s nothing like that "bald spot meets gray ponytail" look when it comes to self-identifying as an IT geek or that vaguely creepy “stuck in the 1970s” sound guy at the local music bar who doesn’t have the talent or nerve to be on stage but toils in the worshipful shadows of decades-younger musicians who do. From PP: “Re: Android tablet. 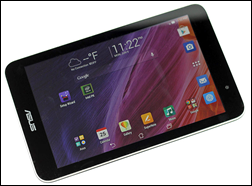 Which inexpensive one did you buy that you liked quite a bit?” I got an Asus MeMO Pad HD 7 in December 2013 for $119 when it was on sale at Office Depot, frustrated that a newer version of my first-generation iPad was more expensive than a laptop. I still use the Asus tablet regularly and have no regrets. Android-powered tablets are just as good or better than the ones Apple sells for multiple their price, which may be why iPad sales are nosediving. I’m a casual user (checking email, looking up stuff on the Web, watching Netflix, and reading Kindle books around the house, all over WiFi instead of cellular), so I don’t need a $499 iPad Air or even a $229 Google Nexus 7. The just-released latest model of the MeMO Pad is $134 on Amazon. The intrepid Dim-Sum provided a detailed update about the Department of Defense’s EHR procurement, so I posted it separately. Athenahealth provided a response to the question from Watertown Boy about the effect of the company’s updated Meaningful Use calculations on those practices that have already attested. I posted their comment under the original question. Half of my poll respondents own stock or other equity of a healthcare IT company. I’m in the other half that doesn’t. New poll to your right: do EHR vendors have too much influence on related government policy? Welcome to new HIStalk Gold Sponsor DocuSign. Its solutions allow business to sign, send, and manage documents in the cloud, making them available and legally enforceable. Healthcare organizations such as Blue Cross Blue Shield, Cedars-Sinai, HCA, and New York-Presbyterian use DocuSign to streamline document-based processes. The result is HIPAA compliance, faster patient inboarding, shortened turnaround time for Medicare billing, and faster handling of paperwork involving credentialing, supplier contracting, and HR. I interviewed the company’s founder, Tom Gonser, a few months ago. I have received documents that required DocuSign signatures and it was infinitely easier than printing, signing, scanning, and emailing. Try it yourself with the company’s 14-day free trial. Thanks to DocuSign for supporting HIStalk. 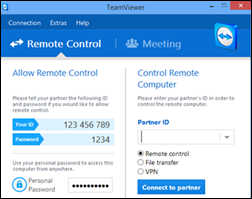 I’ve mentioned before the really cool (and free for personal use) remote control software I use: TeamViewer, from Tampa, FL. You can remote in to someone’s computer to fix something, remote into your own desktop from your phone, transfer files, and even hold online meetings or training sessions for up to 25 people. It is unbelievably simple, reliable, and satisfying to use. Just this week I’ve used it to remote into a colleague’s PC to diagnose a Windows problem and to remote into my home desktop from my phone. Listening: a new hard-rocking single, “Cool Kid,” from The Eeries, an unsigned Philadelphia band. Also: Young the Giant, great California indie rock. 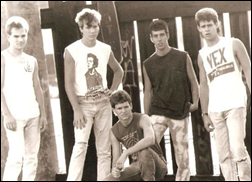 Here’s one more, this one with a healthcare IT angle: VEX (above), a locally popular early 1980s college punk band (Georgia College & State University) featuring a young Larry Stofko, now EVP of the Innovation Institute of St. Joseph Health System of Irvine, CA. VEX’s music is now on CollegeBand, which tracks down long-defunct cult college bands, digitizes their music, and sells it along with merchandise and music rights for movies and TV. That’s my kind of business. Cerner turned in another solid quarter with record quarterly numbers. Epic may be winning most of the high-profile health system deals, but Cerner’s win rate is creeping back up, its Intermountain partnership looks promising, and the company has diversified itself into enough areas of healthcare that its future isn’t dependent on new Millennium sales. Both companies will benefit as Siemens shops its IT division and McKesson sends mixed signals about its health IT commitment. The Boston Globe reviewed EHR safety in a wandering, anecdotal article that decried a lack of mandatory EHR problem reporting and the overall influence of vendors on government policy. It uncovered new information in revealing that a recent study of 5,700 malpractice claims found that EHR-related issues contributed to 46 patient deaths, although the study’s definition of EHR harm was loose: it included incidents involving missing information, incorrect user entries, and problems with providers trying to run EHRs and paper systems at the same time. Two UK hospitals signed huge deals with tarnished vendors. North Bristol will replace Cerner Millennium with CSC’s Lorenzo, whose legendary vendor shortcomings (both product and implementation) killed the government’s $20 billion NPfIT, while the trusts overseeing Watford General Hospital signed a $44 million infrastructure contract with CGI, most widely known for its deep involvement with the failure of Healthcare.gov. Leapfrog Group’s annual report found higher hospital CPOE use, but a third of those systems fail to detect major ordering problems. NantHealth SVP Dave Dyell confirmed an HIStalk reader’s rumor report that he’s leaving the company, Patrick Soon-Shiong’s wildly ambitious conglomeration of a billion dollars’ worth of acquired companies. One of those was Dave’s former employer, medical device integration company iSirona. Health Evolution Partners, a healthcare IT investment vehicle launched by former National Coordinator David Brailer when he left his government position in 2007, appears to be on its last legs. Its only investor, California Public Employees’ Retirement System, wants to cash out after the rookie private equity manager Brailer delivered years of near-zero investment returns despite promising 20 to 30 percent annually. HEP lists seven current portfolio positions, none of them related to healthcare IT. August 12 (Tuesday) 1:00 p.m. ET. 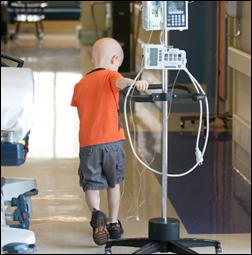 City of Hope Improves the Cancer Patient Experience With Salesforce.com. Sponsored by Salesforce.com. Presenters: Fred Stevens, director of call center operations, City of Hope National Medical Center; Todd Pierce, EVP of operations and mobility, Salesforce.com. Learn how City of Hope improved patient satisfaction and intake inquiries in 16 areas, gave 75 call center representatives the information they needed to deliver a personalized and seamless interaction, improved first-call resolution, and reduced average call transaction time by 42 percent (90 seconds) for over 1 million inbound calls per year. A live demo of Salesforce1 will follow. Sales revenue was up 15 percent and the total backlog is at $9.69 billion. The company says many population health vendors are not aggregating and standardizing data across multiple systems, which makes them of limited value. Cerner says it offers more of a CRM-type system that includes registry functions, data warehouse, analytics, and patient engagement. The ambulatory user count increased to 65,000, double number from “just four years ago” as the company says it is displacing key competitors. Cerner says it is commit to “having the most open EMR,” whatever that means when marketing-minded companies claim they have it while scoffing at open source alternatives. The company says its services and hosting offerings differentiate it from competitors. An analyst asked if Cerner would have a rich opportunity to earn business from clients of Epic given that Epic is “relatively uninterested or unmotivated in pursuing pop health based on some of the chatter in the marketplace.” Zane Burke declined to comment, saying only that the industry needs EHR-agnostic solutions and Cerner’s will work with any EHR. Marc Naughton said that Cerner will have more specifics on their Intermountain project next quarter. I missed this earlier announcement: Google launches Calico, a health and wellness company that has already hired four prominent physicians and named as its CEO the board chair of Apple (who is also board chair at drug maker Genentech.) It seems that Google is dipping toes all over the healthcare waters right after Google co-founder Sergey Brin complained that it’s a waste of his time because it’s too regulated. Maybe he was just being cranky over the FDA’s pressure on his wife’s consumer genetics business 23andMe, which still hasn’t complied with FDA’s requirement that as a medical device, it has to submit validated proof of its accuracy to earn the agency’s marketing approval. Surgical Information Systems names Jim Linder (Norwest Equity Partners) as acting CEO and executive chairman, replacing Ed Daihl. 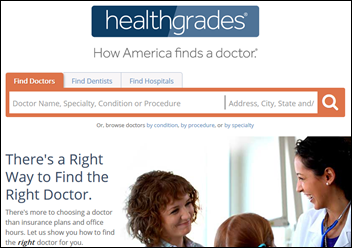 Healthgrades joins athenahealth’s More Disruption Please program, giving athenahealth’s practice customers the ability to post appointment availability online for patient self-scheduling. In the spirit of disruption, I would urge Healthgrades to stop sticking the superfluous “Dr.” in front of every provider’s name – we understand that MD is a doctorate without needing its conferees redundantly identified as “Dr. John Smith, MD.” Every time I see that, I think of chiropractors and podiatrists, whose DC and DPM credentials don’t provide adequate ego stroking since many people don’t know what they mean. “Dr.” in front of a name should be used only in social situations where you might otherwise use Mr. or other titles – it should never be used on a website, business card, sign, online article, or obituary unless you want to emphasize your smug pomposity. 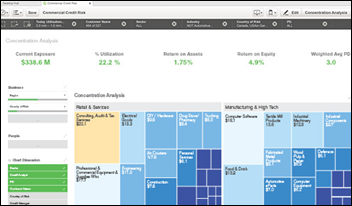 Qlik announces availability of a free desktop version of its data visualization and discovery tool. 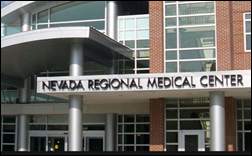 The CFO of 71-bed Nevada Regional Medical Center (MO) blames its Cerner system for ongoing financial losses, saying that its incorrect billing requires the PFS department to analyze claims by hand. IT Director Chris Crist adds, “There’s a lot of problems from the Cerner perspective. Service requests, work orders, take a lot of time to stay on top of, and if you don’t respond to Cerner within a certain amount of time, they close the request.“ That’s a major black eye for Cerner given that its Healthy Nevada community health project is also in Nevada, MO and the hospital ended up with Millennium as part of that deal. The hospital’s CEO provided a predictably laudatory Cerner quote when Healthy Nevada was announced in July 2012, but she and the hospital’s board agreed that it was time for her to leave in February 2014. 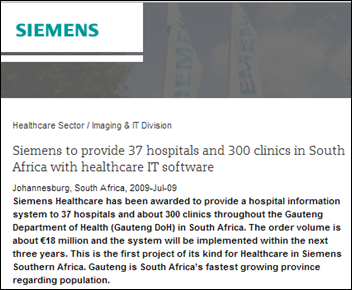 In South Africa, the government freezes the Siemens-related EHR and radiology system contracts of Gauteng Department of Health, worth $133 million, following allegations of bid-rigging. The winning bidder of the 2007 tender, Siemens reseller-controlled Baoki Consortium, provided a health department executive with free housing. Prosecutors added that the bid was issued even though the health department didn’t have the money, infrastructure, or trained users to operate the proposed systems for 37 hospitals and 300 clinics. The systems were never implemented. The contracts were terminated in 2009 when new a Member of the Executive Council was elected. Siemens has been named innumerable times over many decades as being involved, directly or otherwise, in bribery-related contract awards, although it was a subcontractor in this transaction and wasn’t accused of doing anything wrong. Self Regional Hospital (SC) goes public with the news that a laptop stolen in a Memorial Day weekend break-in contained information on at least 500 patients. The laptop was not encrypted. Police arrested two suspects, who said they panicked and threw the laptop into a lake. Perhaps the hospital’s apparently lack of technology sophistication in failing to encrypt PHI-containing devices extends to its website, which automatically starts playing the cheesiest, blandest royalty-free music imaginable as soon as its home page displays, with no option to shut the racket off. Bonny from Aventura did some self-study on the CMS “Two Midnights” rule and decide to memorialize her newfound knowledge as a cartoon. Speaking of Weird Al, you might also appreciate his Word Crimes song. Speaking of what are we getting, I have not read any outcomes reports or cost effectiveness reports of HIT recently. And where are the reports of benefits, if any, of MU? And of the unintended consequences? You would think that the Congress would want to know what it has gotten, as opined by Rep. Gingrey on the vendor impediments to interoperability. When are the administrators of these 100-bed or less hospitals (Nevada Regional) ever going to stop blaming the vendors for their “financial losses” when 9 times out of 10, hospitals this size are either ill-equipped to manage a system from Cerner, Epic, Allscripts, or the like, or do not provide enough resources to effectively install the software to begin with? That is not to say it is totally abhorrent to think that a 71-bed hospital barely making ends meet should have to invest in a $10 million EMR system to begin with, but if you DO decide to take that plunge, you might do yourself and your hospital a favor and make sure you are making the investment all-in instead of half baked like most try to do. The end result will be worse “financial losses” that just investing in the system. Not to worry, Dr. M saw it coming and he proposed a user fee for the benefit of getting certified and how it REALLY helped improve HIT systems. After which ONC proposed to Congress that ONC s/b responsible for safety testing EHR software just like the FDA. Again with user fee support. 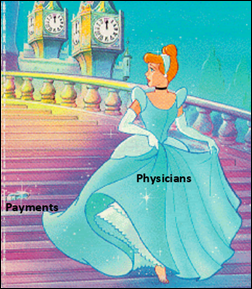 So you see DHSS and ONC are really ‘entrepreneurs’…they’ll find a way. Thanks for the shout out on VEX!! First off, you are absolutely correct, gov depts like ONC and countless others will go in indefinitely, once established unless someone has the guts to say enough already, you’ve done a “good job” but your job is done. ONC’s current efforts to recast itself to still be relevant, well I think it’s time to say enough. And on that Cerner call, they were actually quite bullish on selling their PHM suite into non-Cerner accts, including Epic, though they did not single out Epic as only opportunity. What I thought was particularly interesting was their growing traction with CommunityWorks. Will they be able to take a significant chunk out of Meditech and others in this mkt? That is where the growth is for HIS.